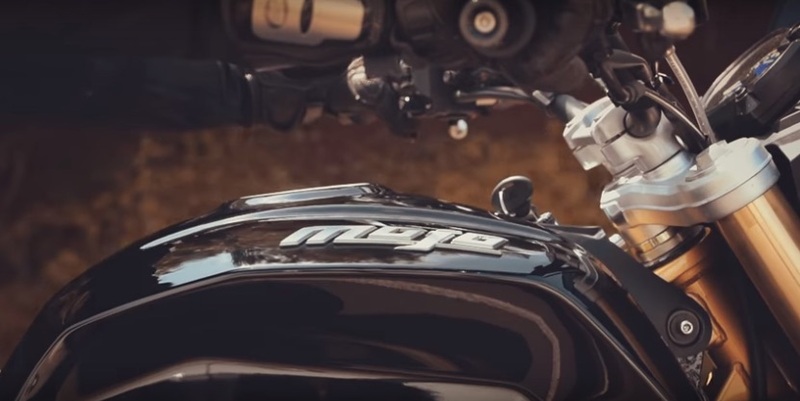 The all new Mahindra Mojo, the 300cc bike’s launch is nearing, the official logo and teaser video for Mojo has been released. Reports from other media houses have revealed that various Mahindra dealers have begun accepting bookings for the Mojo motorcycle. One of the Mojo customers who has already placed booking has informed that Mahindra Mojo would be priced at Rs 1.8 lakh (as per ex-showroom price Mumbai). Also reports have revealed that Mahindra shall offer an early bird discount of 20,000 INR for those who book the bike in advance. Sometime back, the company stated that Mojo is going to use a 292cc, single-cylinder, four-stroke, liquid-cooled and fuel-injected engine. The liquid-cooled engine of Mahindra Mojo would be generating maximum power of 27bhp, with a maximum torque of 3kgm. Reports from AutoCarIndia suggests that the Mojo motorcycle from Mahindra is going to get one-into-two stubby-looking exhaust canisters which are placed on either side of the morforcycle. The Mahindra Mojo would use top-spec upside down front forks that is coupled with rear monoshock which is bolted onto a swingarm that gets a splash of gold. The handlebar and centre-set footrests are placed to offer an upright riding stance. For stopping power, the Mahindra Mojo is equipped with a single front and rear disc brake. In addition to opening the early-bird offer, Mahindra is giving away jacket and helmet for free for those who purchase the Mahindra Mojo.